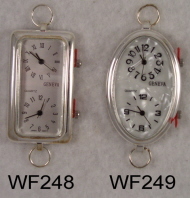 Changeable watch faces can be used on our Changeable watch bands (also known as Build-A-Watch). 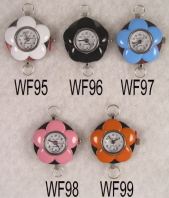 The Changeable watch faces and bands allow you to order just a few faces and bands and have a large variety of choices. All watch bands will fit on all watch faces. 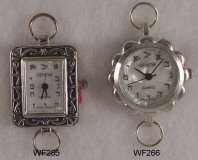 Most watch faces and loops are approximately 1 1/2" long. We specialize in Geneva and Trendz watch faces. These are of the highest quality. Most batteries last 1 year. We will replace your battery for free for as long as you own your watch. Just send the watch face to our mailing address (listed in our About our products link) and we will replace the battery and mail it back to you. 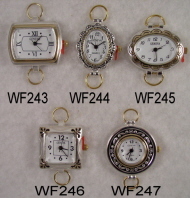 Interchangeable watch bands and faces come in Silver and Gold tone. 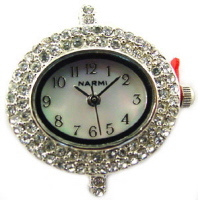 Click below on the watch face you want to order and enter the Product ID code for the watch face. Click on the Build-A-Watch bands link on the left to view the instructions for ordering Changeable watch bands.